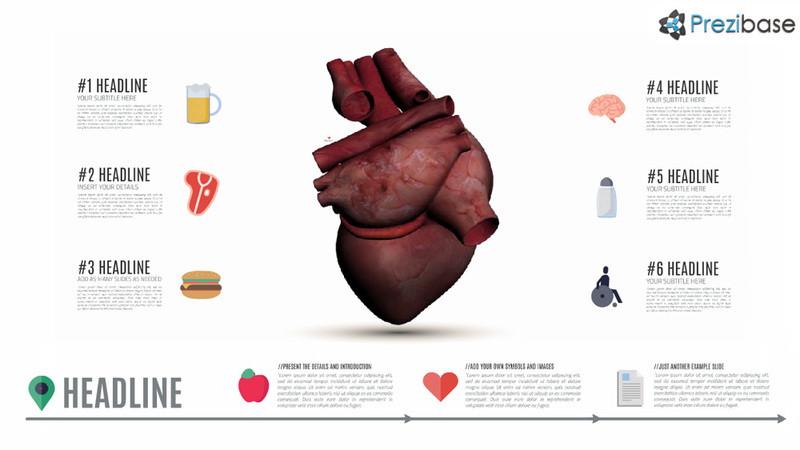 Prezi Presentation Template with an animated realistic human beating heart video background. Good template for presentation related with heart diseases or other medical conditions. Talk about health risks, foods, diets, staying healthy. A clean and infographic template with simple placeholders. Create a presentation about healthcare, sports, dieting, healthy eating, blood, medical conditions, biology. This entry was posted in Best Prezi presentation templates and tagged 3d, 3d animated heart, 3d heart presentation, about, an, and, animated, animated heart, animated heart presentation, animated heart presentation template, animated presentation, animateevideo, avideo, backgound, beating heart, health, healthcare, heart, heart condition, heart disease, lifestyle, medical, medical heart presentation ppt, medical presentation, prezi template, prezi templates, real heart, real heart presentation, realistic heart presentation, surgery.